Our Xulon Press Successful Author Spotlight is honored to feature entrepreneur, rapper, inspirational/motivational speaker, TV writer/producer, actor, comedian and author Lon Jordan, www.lonjordan.net, who wrote the book “Sketched by Design: Discover Your Unique Design in the 21st Century Marketplace”, a blueprint for the youth of today to understand and apply the principles of God’s plan for their life in their workplace and in everyday life. His book can be applied in the secular world as “unique by design” and also applies in the Christian world as “sketched by design”. In a day when our world is bashing our youth for all of the “wrong” they are displaying by their actions, Lon is a refreshing reminder of the “right” in our youth and their actions that are examples of what God can do with a young heart who is dedicated to the Lord. Lon embodies the desire to use his talents for the one who gave them to him—in whatever capacity and through whatever door God opens! Lon is willing to be used for God’s glory. A graduate of Southeastern University, in Lakeland, Florida, Lon began his hip-hop rapper career as “B Boy Lon” on that campus, and was even featured with actor Clifton Davis in “Streets of Gold”. He has written articles for the national PTA organization, featured in the PTA’s “Our Children” magazine, and most recently, he pitched the idea for “What’s Real TV” show, in which he produces and stars, that has been picked up and is being broadcast on the TCT Christian Television, Saturday night 10pm. “Sketched by Design” will teach you critical principles and philosophies on how to discover your unique design in the 21st century marketplace. In this book, parents and educators will be empowered to develop their unique design, while pursuing a unified effort in shaping their children’s future. 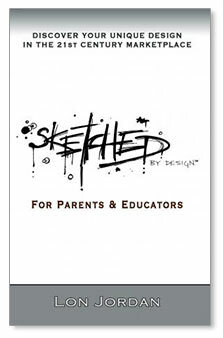 “Sketched by Design” illustrates how to: Gain insight into the 21st century marketplace, Turn your pain into purpose, Effectively communicate with Generation Y, Create an environment where imagination can flourish, Cultivate your student’s unique design, as well as how to leave a legacy that will impact generations to come. Lon Jordan is the CEO of Sketched Publishing, Inc. An organization dedicated to cultivating the unique design of every individual. I was inspired just speaking with him. Lon was candid and personal, and shared a deep hurt that God healed in his heart. It was such sage advice for his Y Generation. A visionary indeed—who is applying his passion to his generation by example! And making a difference in his world! As we concluded our conversation, I felt in my spirit that I had not heard the last of Lon Jordan. I found him to be a voice to be heard by all generations, not just Generation Y. His insight was heavenly and his passion was palpable—this is a young man who is going places and leaving a lesson plan for every step of the way. He is proving that life is sketched by design—and the Master Designer is Jesus Christ! I for one am glad that Lon is leading his generation to be unique for God! Together, I am confident that they can change the world and live a life of character! After all—Character is a Choice!